“1 Paul and Timothy, bond-servants of Christ Jesus, to all the saints in Christ Jesus who are in Philippi, including the overseers and deacons: 2 Grace to you and peace from God our Father and the Lord Jesus Christ. 3 I thank my God in all my remembrance of you, 4 always offering prayer with joy in my every prayer for you all, 5 in view of your participation in the gospel from the first day until now. 6 For I am confident of this very thing, that He who began a good work in you will perfect it until the day of Christ Jesus. 7 For it is only right for me to feel this way about you all, because I have you in my heart, since both in my imprisonment and in the defense and confirmation of the gospel, you all are partakers of grace with me. 8 For God is my witness, how I long for you all with the affection of Christ Jesus. 9 And this I pray, that your love may abound still more and more in real knowledge and all discernment, 10 so that you may approve the things that are excellent, in order to be sincere and blameless until the day of Christ; 11 having been filled with the fruit of righteousness which comes through Jesus Christ, to the glory and praise of God,” Philippians 1:1-11. 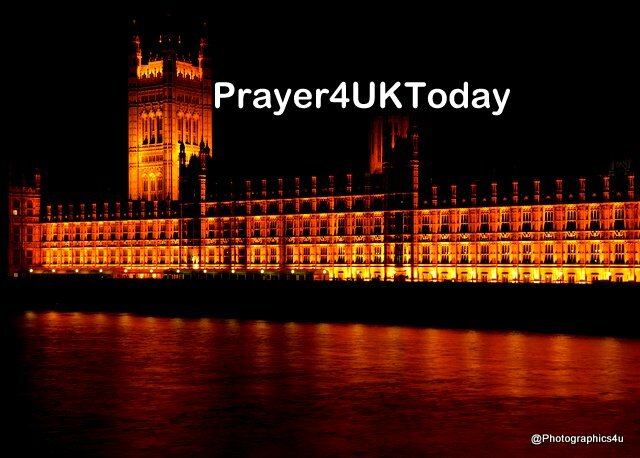 We pray for Theresa May as she meets with the 1922 Committee to discuss Brexit. We ask You Father God to guide the discussions with Your Holy Spirit.  We decree and declare GRACE to you and PEACE/ SHALOM from God our Father and the Lord Jesus Christ/ Yeshua Messiah! We are thankful for you and pray for you often, with JOY, because of the FAITH you share in PROCLAIMING the GOOD NEWS!  We decree and declare with CONFIDENCE that the One Who began a GOOD WORK among you will keep it GROWING until it is completed on the Day of Christ Jesus/ Messiah Yeshua. It is GOOD that we have each other on our hearts and think this way of one another. For we are all DEFENDING and ESTABLISHING the Good News, and sharing with one another in this privileged work.  We decree and declare our prayer for you is that your LOVE will more and more OVERFLOW in FULLNESS of KNOWLEDGE and DEPTH of DISCERNMENT, so that you will be ale to determine what is best and thus be PURE and WITHOUT BLAME for the Day of Christ/ Messiah, FILLED with the FRUIT of RIGHTEOUSNESS that comes through Jesus Christ/ Yeshua Messiah – to the GLORY and PRAISE of God. I n 1917 at least in part for short term gain, the Balfour Declaration was signed. What became the conflict in Israel Palestine was in part shaped in the closing years of World War I. Today there are many people from different lands all trying to play their part in building peace. Courageous Palestinians having been denied their human rights for generations yet refuse to turn to violence. Israeli peace activists facing hostility from their own communities bravely work to bring people together and understand each other, though these actions seldom get reported in the news. We believe in a God who cares for all his children, and for whom justice and peace are qualities of his being. Jesus said ‘blessed are the peacemakers’.